The invention of electricity is one of the most important events in the history of mankind. Electricity and modern electrical gadgets have made our life much easier and provide us with more time to indulge in other activities. While on one hand, we hire Atlanta electrical contractors to add more outlets or upgrade our electrical panel boxes so as to accommodate more electrical equipment, we often don’t take adequate care to ensure that their wirings and cords are in proper order. We may have our heavy boxes or furniture resting on the cords or sometimes, the electric wiring could run under our carpet and get overheated. For our convenience, we may even use nails or staples to attach the cords to the walls or baseboards. All these activities result in damaged or frayed electrical wiring that needs immediate repair to prevent the occurrence of any fire hazards and electric shocks. According to the National Fire Protection Agency, 6400 electrical fire accidents were caused in the last 5 years due to damaged electrical wiring. In order to protect your loved ones from getting hurt due to electrical mishaps, it is very important that we regularly check home appliances and other electrically powered devices for frayed wires. Any electronic device in your home should not have visible wires, as bare wires can lead to electric shocks as soon as someone touches it. 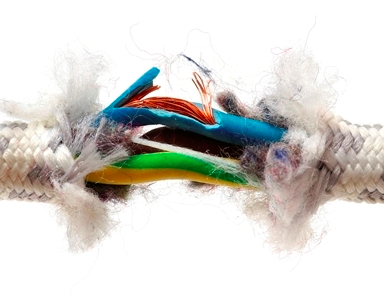 Frayed wires can also be hazardous even when you are not using an electrical item. Our first instinct on seeing a frayed wire is to strip the wire and mend it by wrapping it using an electrical tape. In extreme cases, we may just strip the wire and reinsert it into the socket. Both scenarios can prove to be dangerous. The best way to deal with the problem of a frayed wire is to hire the help of an experienced Atlanta electrical contractor to replace the wiring. Do not attempt to repair the frayed wires yourself, as this can prove to be dangerous. An experienced certified professional can easily detect and fix the problem the very first time.